Milky Way Provides Service to Client - But Client Provided More Service to U.S.!!! Slow Laker Day Trumped by a King! Big Waves Result in Big Fish! Calm Day of Fishing Before the Storm! Gold Star Crew - Gold Star Day! Bragging Rights - For the Kings or the Lakers? Bragging Rights for Biggest Fish! Fishermen Battle Rough Seas and Kings! Guys Discover What Lake Ontario Has to Offer! Lewis Co. Boys Vs. Kings & Lakers! Lots of Fish! = Lots of Fun! Perfect First Time Lake Ontario Fishing Experience! PA Family Catches Bounty of Fish! Short Day of Fishing Produces Big King! Big King Saves The Day on Rough Waters! Lake Trout Limit for Father's Day! Bass Masters "Master" Lunker Lake Trout! Lake Trout Limit for the Bob Zehr Party! Couples Take On Lakers Texan-Style! Grandfather/Grandson Team Take on Lake Ontario! Lewis Co. Boys Take on the Lakers! Boys from Maine Limit Out on Lake Trout! The Lake Trout Keep Coming! 22 lb. King Shows Up With Lake Trout Limit Catch! Farmer's Yield Good in Gold Star Corporate Trip! Five Kings for the Five Zehr Brothers! Fontaine Family Proves Everyone Can Put FIsh in a Boat! Helicopter Pilot Proves He Can Maneuver Lake Trout! Labor Day Was No Holiday for the Lake Trout! Lake Trout Limit Trumped With Kings! Lewis County Boys Limit On Lake Trout and Add Quad of Kings! Limits of Lake Trout for 3-Boat Corporate Charter! Lake Trout Limit Includes Two Lunkers Pushing Over 30 Inches! Gorgeous Weather and Lake Trout Limit Team Up For a Perfect Day of Fishing! Big Fish Day Results in 7 Kings and 2 Lakers! A Big Catch of Lake Trout for the Mark Widrick Family! Granddad/Grandson Team Take on Lunker Lake Trout Limit! Backus Party Half-Day Charter Paid Off! With Big King! Lake Trout Limit With 4 Kings Makes for a Great Day! 2-Day Charter Highlighted in Catch of 22 Pound Monster Lake Trout! A Lake Trout Limit & 3 King Day for the Tony Jaczko Charter! 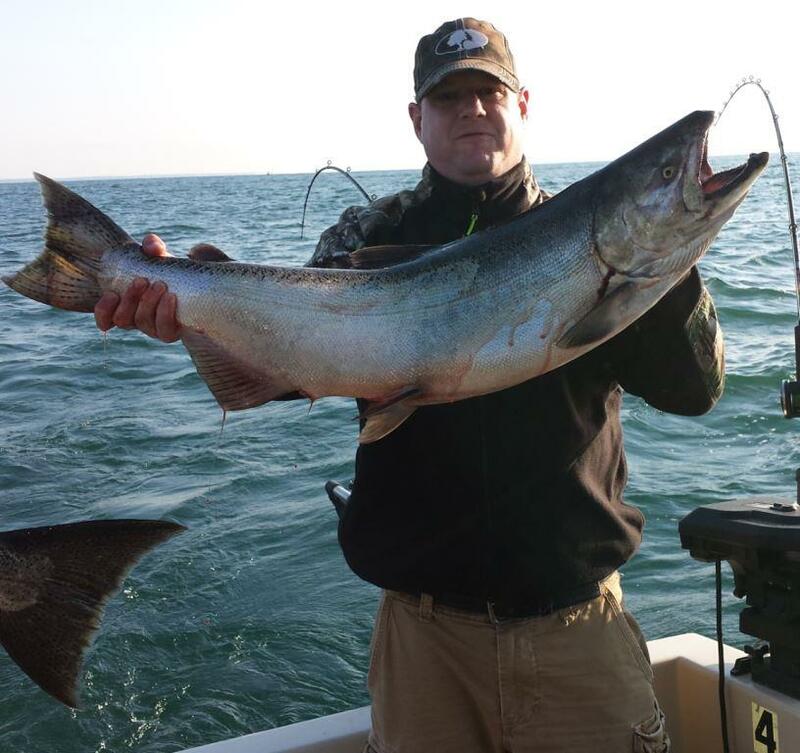 The Marc Albano Fishing Crew Hits the Jackpot With Kings! 1 King and 2 Coho Salmon Add to the Lake Trout Limit for the Rick Welsh Party! Limit of Lake Trout & 1 King for the Pate Charter! Lots of Fun & Lots of Fish for the Harrison Family! Rough Seas & Tough Fishing Still Results in Lots of Smiles! Lake Trout Limit & Bonus Big King!